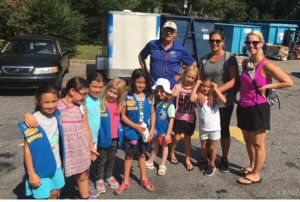 For the past 10 years Girl Scout troops from the Two Bridges Service Unit have been Holiday Caroling for Cans in effort to collect donated goods for North Fulton Community Charities while spreading Holiday cheer. This year we have chosen the DoubleGate neighborhood and have 10 troops (over 80 girl scouts!) wanting to sing holiday songs to your family in exchange for a couple non-perishable items. North Fulton Community Charities supports over 1,200 North Fulton families during the holiday season and thousands more families throughout the year. The NFCC’s list of most needed items is below. In previous years we have collected over 3,000 donated items and helped to feed and provide for many families. Please support our girls for our annual Caroling for Cans this year on December 16th from 5:00 – 6:30pm. If you would like to participate, please sign up with your name and street address below on the sign-up genius link. On December 9th we will drop off a list a needed items you can chose from and a brown paper bag and pick it up during caroling on December 16th. **If you have any questions you may call or text Lauren Hill (678) 773-3328, or Tamara Liles (910) 382-6657. Dried Beans 1 lb. bags. Twingate Drive Traffic Restrictions Oct 4th & 5th!